There are two main types of shungite on the market: elite (or noble) shungite and regular shungite. The main difference between them is the amount of organic carbon stones contain. Rare elite shungite nuggets include over 90% of purest carbon and have more powerful healing energy. High percentage of carbon makes elite crystals rarest, but extremely fragile type of shungite. It is hard to be shaped or polished. Therefore, noble shungite specimens are usually sold in their unique natural shape. Most shaped shungite items like pyramids, spheres or beads are made of regular shungite with about 30-50% of carbon. Thanks to its deep black color this type of shungite is extremely popular among handmade jewelry designers all over the world. 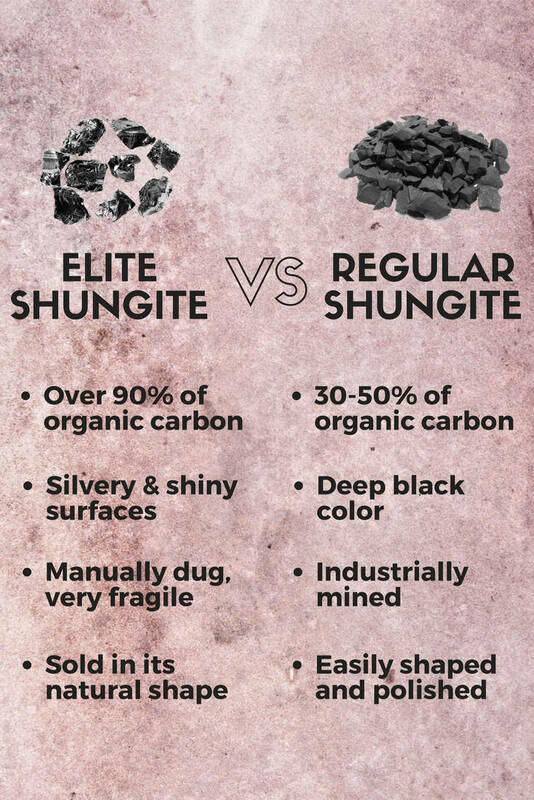 Learn the difference between elite and regular shungite with Karelian Heritage infographic and choose the type you like.